Paramus, N.J., February 5, 2019 – Sony and lecture capture solution provider UbiCast have announced the launch of Miris Netcapture software and Miris Video Platform, which marks the first joint effort between the two organizations in the North American market. 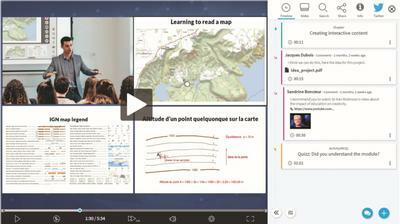 The new network-based lecture capture solution seamlessly integrates with Vision Exchange, Sony's flagship active learning and interactive lecture solution, to create more engaging and immersive video content for learning. As a cornerstone of modern teaching philosophies, interactive lectures bring students and teachers together to directly interact, collaborate and brainstorm with one another while boosting engagement, information retention and general understanding of the subject matter. In combination with Vision Exchange, the new Miris Netcapture offers education organizations a flexible and scalable solution that enables interactive lectures and lecture capture all at once, in a cost-effective manner. "As another pioneering solution of interactive lecture technology, Sony's Vision Exchange complements Miris Netcapture perfectly," said Jean-Marie Cognet, CEO of UbiCast. "Together, it is fantastic to offer universities, lecturers and students access to cutting-edge, interactive and dynamic content. We're extremely excited to see how the solution we've jointly developed will go on to help the next generation of students." While Sony's Vision Exchange allows students and teachers to share and annotate content wirelessly from their laptop, smartphone or tablet devices to the front of a classroom, Miris Netcapture records the streamed content from Vision Exchange and transfers it to UbiCast's Miris Video Platform, for editing, managing and distributing the video content through a video player dedicated to social learning. This network-based content capture solution removes the need for each room or lecture hall to be equipped with their own recording device. Instead, Miris Netcapture will simply be permanently located in the server room and dynamically capture the required classroom. By centralizing content capturing and using Miris Netcapture, universities will be able to dramatically increase the number of classrooms that are capable of cutting-edge lecture capture for their students, unlocking greater scalability at a much lower budget than before. Meanwhile, for AV managers, centralizing the capture solution reduces the need for time-intensive hardware checks throughout a building, and also reduces the risk of hardware failure. With ongoing software updates, the solution will become more feature-rich and powerful over time. "After learning what our higher-education customers value, we found that they need a lecture capture solution that is reliable, easy to use, high quality and cost effective, without requiring dedicated hardware," said Mike Fasulo, president and chief operating officer, Sony Electronics North America. "We turned to UbiCast, who has been successfully working with Sony in Europe, to develop an intuitive and networked lecture capture experience for the North American market that cohesively aligns with our existing solutions. Vision Exchange seamlessly integrates with UbiCast's networked lecture capture capabilities, offering all of the benefits our customers requested while meeting the increasing demand from students and teachers for technology-enhanced, collaborative and immersive learning environments." With the ability to capture high-definition recordings from up to six different video/audio sources simultaneously, Miris Netcapture also offers a highly flexible and future-proof solution. Teachers are able to capture a recording of the presentation they are delivering, as well as simultaneous video of themselves delivering the lesson, and student's questions and reactions. By capturing a truly holistic representation of a practical teaching environment, Miris Netcapture vastly improves the future value of the lesson capture for students and teachers alike, compared to a traditional, single-camera video capture. Captured content is then edited and published through UbiCast's powerful Miris Video Platform, which is compatible with all LTI-compliant LMS platforms and provides the ability to add interactivity to a recording. For example, a teacher can add a poll within the video to encourage student engagement or add a quiz at the end to check student understanding. All the characters within the slide content can also be indexed for searchability, so students can quickly get up to speed on something they missed or would like to revisit. Students are also able to add comments, private notes, ask questions and share links or files to further enrich the conversation and increase peer-group collaborating. Dynamic Rich Media—the ability to view multiple capture feeds simultaneously—means individuals can choose which part of the capture they wish to focus on by enlarging one stream over another. Students writing a piece of coursework may want to focus on the details of a presentation, while a lecturer may study their students' reactions and questions to better understand which areas they find difficult, and apply those learnings to future lessons. The new Sony integrated Miris Netcapture and Miris Video Platform solution for higher education is planned to be available in February in North America.